I like the blue and yellow combinations. She does seem to be intently reading. It’s interesting that the smoke seems to be coming from the corner of her mouth. Perhaps she didn’t want to “cloud” her vision. Hope you’re having a great week! Great shot Marcus. She looks all caught up in the moment and like she is taking her smoke seriously. I thought of monochrome too, but the yellow is what adds to the picture. Great work as always. I like the blue and yellow. 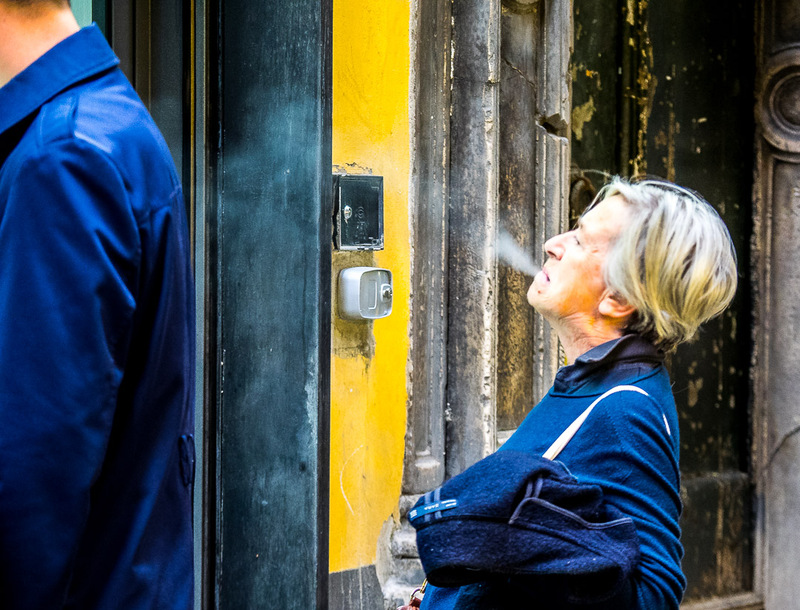 Smoking always makes interesting street photography even though I don’t smoke myself and think it’s acky, but I do like looking at images. Nice shot of the woman exhaling. Thanks, Cassia, and to not smoke is REALLY cool!! It was a good choice not to convert the picture to black and white. I think the blue and yellow actually make the photograph. The background is great too. That is an excellent photograph! Marcus, you made a good decision not converting this photo to monochrome. The colors are strong characters also. I love this moment! Unique! This is a great photo, Marcus. She looks like she is blowing it out of the corner of her mouth. No, I don’t get the ‘smoking’ thing, either. Coffee; however–oh, yes!